Strong Foundations for Young Children provides free coaching, modeling and support to families with infants and young children who are struggling with challenging behavior and delayed social emotional development. the eligible child must have challenging behaviors, delayed social emotional skills or other high needs. ​Priority will go to families that are not yet connected to community services and have a child with high needs. The program duration is typically 3-6 months (or less, depending on the needs of the family). There are no costs to the family and no insurance requirements. The type and quantity of services are tailored to the individual needs of each child and family. We will typically visit the family at home and provide help with setting goals, coaching and modeling strategies for parents or caregivers, and connecting families with needed resources in the community. 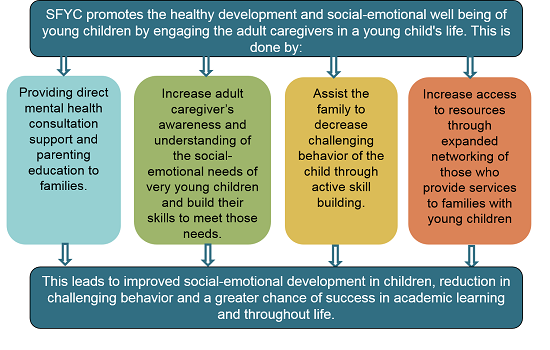 The family and clinician will work together to determine appropriate goals for the family to support the social emotional development of the child, reducing challenging behaviors. Sarah Lusardi, IECMH Clinical Supervisor at CES, coordinates all referrals and intakes. Please fax or email the completed referral form to Sarah's attention via 413.586.1725 or slusardi@collaborative.org. Donate to Strong Foundations today! Strong Foundations for Young Children is supported by individual donors. Thank you to Susan Clopton and John Levine for their generous challenge matching grant! We seek help from the community in order to maintain our level of service to local families in need. Please consider donating today to help a new Strong Foundations family in need. Many thanks to Broadside Bookstore! Strong Foundations was the featured non-profit of the month during July at Broadside, and we are grateful for the support!